Besides taking walks and photographing the landscape for Pedestrian Conflict, I’ve also had time to meet some of the folks in town and learn more about the fishing industry here. Earlier this week I had the chance to sit down and talk with with Ásgeir Ásgeirsson, the director of a small, family-operated fish processing facility here in Ólafsfjörður. His family has lived in the region for over three generations and witnessed a lot of changes. One of the most influential occurred in the 1990’s when local fisherman started using trawlers that could process fish on board (filet and freeze) as opposed to returning to port to do this work. Fish processing was the primary employment for many women and young people in town, so the new processing methods had quite an effect on employment and social organization. By Ásgeir’s estimates, about 300 (out of a population of 1100) left the village looking elsewhere for work. Young people no longer had access to summer jobs, which meant that demographics were also changing. But in the last few years, Ásgeir was keen to point out, things have been looking up. The tunnel to Siglufjörður, finished in 2010, meant that people could move more efficiently between the two towns. In addition, a regional Junior College opened, meaning that young adults seeking avenues to higher education no longer had to leave the village to do so. I also learned some interesting facts about the history of Ólafsfjörður. In the 1940’s, the energy source for the town switched from coal (which had to be shipped in by sea) to geothermal, which was more environmentally sustainable and also much cheaper. The laying of hot water pipes throughout the village provided a lot of work for people during the post-war period. But in the winters, many fishermen went south to find work in the parts of Iceland where the fish catch was plentiful. Ásgeir told us jokingly that a lot of his pals had matronyms (names after their mothers) during that time because their fathers were gone for half the year. In the Nordic naming tradition, surnames are not fixed but rather built by adding a suffix to the first name of one of the parents: traditionally this would be the father. So it is clear that changes to the fish market in Ólafsfjörður also had cultural effects. In the 1990’s when local fisherman started using trawlers that could process fish on board (filet and freeze) as opposed to returning to port to do this work. Fish processing was the primary employment for many women and young people in town, so the new processing methods had quite an effect on employment and social organization. By Ásgeir’s estimates, about 300 (out of a population of 1100) left the village looking elsewhere for work. Young people no longer had access to summer jobs, which meant that demographics were also changing. 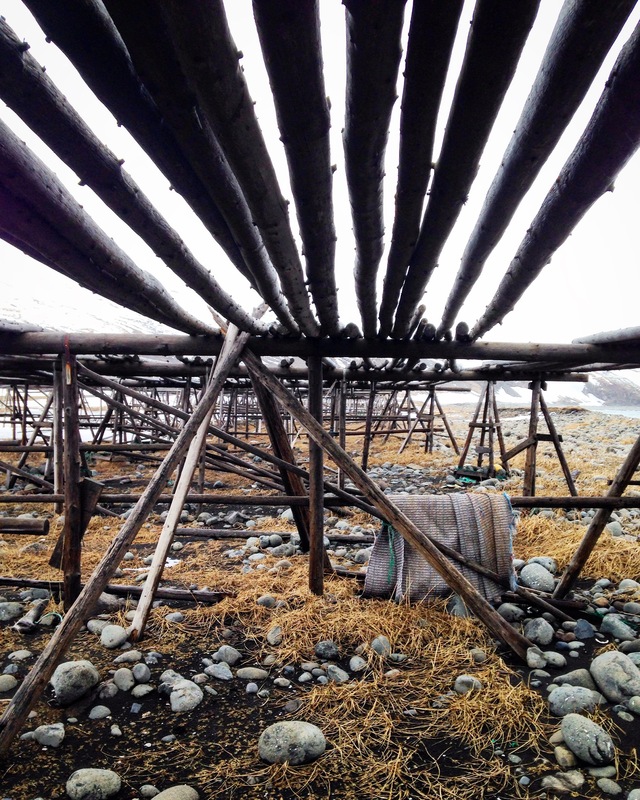 In the 1980’s, fish in Ólafsfjörður were still being processed (dried) on large wooden structures built on the edge of the sea for this purpose. But the introduction of the quota system changed the nature of fishing in Iceland. Now, trawlers take their frozen catch to the nearby town of Dalvik for processing. It is interesting that one cannot purchase fresh fish in the village. I’ve been told that if I want a fresh fish, I need to try my luck at the dock where private fisherman might be bringing in a catch. Ásgeir, who obtained a Masters in Fisheries Science from Norway after many years of fishing locally, saw an opportunity: he devised a plan to buy the discarded parts of fish (the head, skeleton, trimmings etc) from the filet plants, and then process and export them as a cheap, concentrated protein source with a long shelf-life. Currently, most of his dried fish is sold to Nigeria and Brazil, where vendors are interested in importing inexpensive fish protein for local markets. In 2003, Iceland exported about 15,000 tons of dried cod heads and fish trimmings, mainly to Nigeria. I did a bit of research and found out that Nigeria has long been a market for Icelandic fish, particularly dried cod heads. The Icelandic Ministry of Fisheries and Agriculture estimates that exports to Nigeria has a current value of 12.4 billion ISK (EUR 77 million / USD 107 million), making Nigeria one of the 10 largest buyers of Icelandic seafood products. But one has to ask why it is that Nigerian fish stocks are so low that the country must import dried fish heads and carcasses from markets across the Atlantic? The answer of course is in the destruction of West African owned fisheries by the selling of quotas to the EU at the expense of local fisherman. 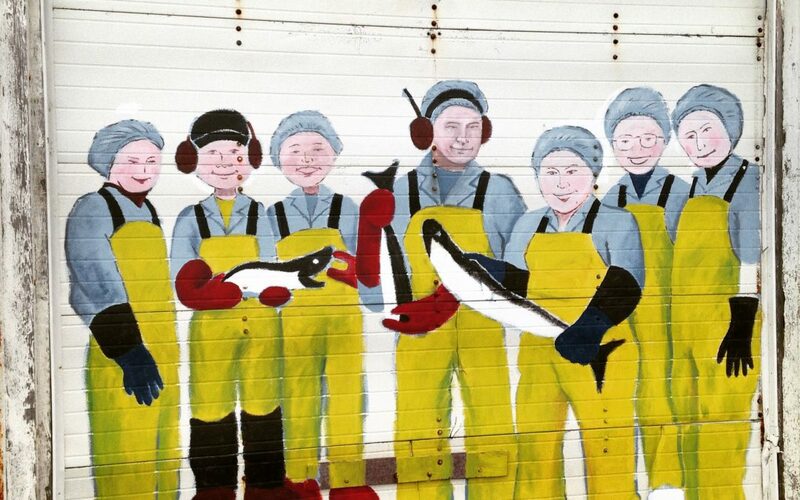 The politics of fish in this small Icelandic village has a global reach. Here is a visual essay of the process of making the dried fish at Norlandia. Using traditional methods to dry cod heads could take 6 months, whereas the factory produces a container of fish heads in about 6 days.